I’d die happy, for they’d only known a better world. My grandfather was cured of polio as a child. “Polio,” was the only answer I could give. His leg is atrophied from the polio, but the bounce in his step overrides the slight lag in his stride. Life is good. Family, friends, pasta, and red wine. What more could an Italian grandpa need? According to my relatives, Papa was blessed while riding on a parade float during the Feast of the Three Saints. The polio disappeared after that. I always thought that Jonas Salk played a hand in his cure, but perhaps I just really like the aspect of vagueness. That’s where the faith is found, after all. I will accept nothing less than a diabetes cure in my lifetime. Plain and simple. That faith will always be here. When I am cured, I will hold onto that faith until every individual worldwide who is touched by diabetes receives the same renewed membership at quality of life. 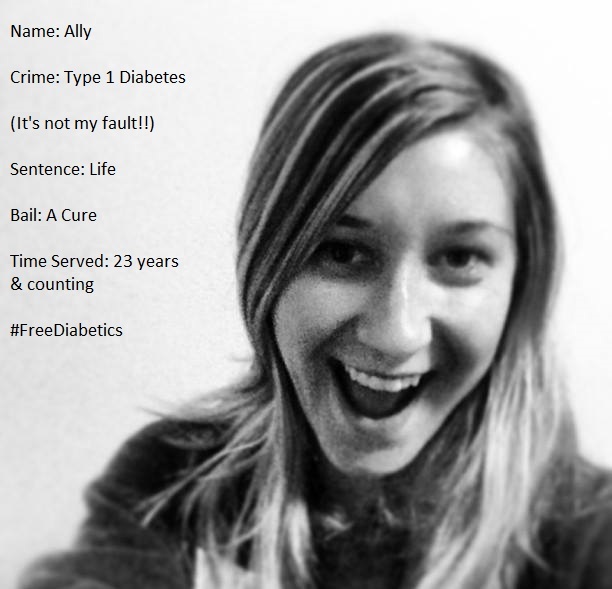 Type 1 diabetes has dwelled in my body for almost 25 years. It has undeniably left its mark. Freckled fingertips. Dexcom rashes. Bruises galore. As one friend recently joked, “You might want to leave those details out of your Tinder profile!” Very true. Diabetes has permanently affected my life, and yours. I would be naïve to think that after 25 years, a cure will eradicate all of those diabetes handprints. It won’t. Some of the damage is already done. But curing diabetes is also not all about me. If I am going to be on this earth as a diabetic, if I have endured this crap for 25 years, if I know darn well how unrelenting some days are- then I cannot sit back and be okay with this in the 21st century. We have the scientific brilliance to cure this disease. We have the technology to cure diabetes. And we most certainly have the motivation by which to accelerate research. Look no further than any diabetes blog or heartfelt Facebook post by a D parent whose child just wants to eat cupcakes like the rest of the class, with no needles involved in the process. Curing diabetes will involve faith, fundraising, advocating, and destigmatizing. The #doc is well-suited to do this job. It is 2015. It’s about darn time for a cure. I am excited about the pending technological options which will tide us over in the interim, but ultimately we need a cure. If not for us in the here and now, then for all of the generations which will come after us. It is our moral obligation to change this status quo. November- diabetes awareness month- is about keeping the faith. If my grandfather and his family had not believed that his polio would be cured- by whatever means- he may not have lived long enough to walk around the world free of leg braces, or to marry his high school sweetheart, or to still be madly in love so many years later. He needed a cure, too. He kept the faith, and he got the cure. I fear insulin- too much and too little and not finding that happy medium dose. I fear carbohydrates- too many or too few. My biggest fear, though, is misconception. If something “bad” ever happens diabetes-wise, others might think that I didn’t try. brush the spider off the car windshield. Say a prayer and take the insulin. Treat the lows and the highs. I love this movement because it is short and sweet (pun intended). Side Note: Very Light, No Sugar suggests looking at Faustman Lab at Massachusetts General Hospital and donating whatever you can- even the $2.00 that you would normally spend on your morning coffee- to help us to one day rid the world of diabetes.